Children reading to shelter dogs is adorable. Kids are practicing their reading to shy shelter dogs. Thanks to a new program at the Humane Society of Missouri, children learning to read can practice their skills on timid shelter dogs to help them socialise. 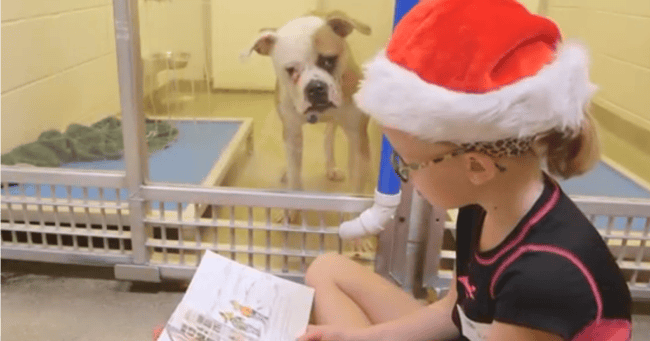 Dubbed the Shelter Buddies Reading Program, the program is designed so that shy shelter dogs are not left to their own devices craving attention all day, but instead are gifted with the presence of a small human reading them stories. According to program director Jo Klepacki who spoke to The Dodo, the idea was born from a desire to help the dogs learn to socialise with humans before they were adopted. “We wanted to help our shy and fearful dogs without forcing physical interaction with them to see the positive effect that could have on them,”she said. To ensure the dogs interact, the children can also pass treats to the dogs if they come to the front of the kennel, positively reinforcing the behaviour. Children as young as 6 and as old as 15 can be involved in the program, and they are then trained to be able to to read a dog’s body language to tell if they are stressed out or anxious. According to ABC News‘ interview with Klepacki, dogs that are confined to shelter-like environment often exhibit signs of stress and anxiety. Watch: Mia Freedman adopts a puppy from Sydney Dogs and Cats Home.